SE picked up her Preferred Novice Title with a 2nd and a 193 1/2 on Friday at the Irish Setter Specialty. Got her 2nd leg of her CD with a 4th and 190 1/2 on Saturday. And today, she picked up her 3rd leg of Novice B with a 2nd and a 193 1/2. Since January of this year, she has earned her Beginner Novice, Preferred Novice, Companion Dog (AKC), her UDC Novice B @ Nationals, her WAE and her BH. I have only had three Dobermans in my life and she raises the bar on what each could do. She is my 2nd Doberman to do obedience with and I am so proud of her work ethic. Now we will concentrate on Preferred Open and Graduate Novice. The best is yet to come. Congrats Sandy ! You 2 have being doing some serious work since Jan ! Congrats.....always so nice to see the hard work pay off !! We are very proud of you both. Biiiig congrats! Any chance we get some pictures? Never have learned how to put pictures up at this site. Have some nice ones, especially of Nationals but alas, I am not literate when it comes to computers. What are you working off of....Ipad tablet, Iphone, computer with a tower? Computer with a tower. 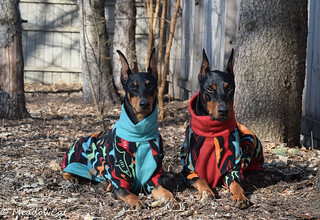 Sorry, been busy and not on Dobermantalk for awhile. There are other photo hosting sites, but I recommend you not use Photobucket, as they charge for third party sharing these days.